Lighting the Paths Across the U.S.
Thanksgiving is a time for family, for feasting, and for gratitude in the United States. It is also a time when the nation’s transportation network is clogged with travelers. According to the American Automobile Association, an estimated 43.4 million Americans will travel 50 miles (80 kilometers) or more during Thanksgiving week, with the average round trip being 600 miles (1,000 kilometers). More than 90 percent of them will use cars or trucks, while the rest will ride planes or trains. The United States has more roads—4.1 million miles (6.6 million kilometers)—than any other nation in the world, and roughly 40 percent more than second-ranked India. About 47,000 of those U.S. miles are part of the Interstate Highway System, established by President Dwight Eisenhower in the 1950s. The country also has 127,000 miles (204,000 kilometers) of railroad tracks and about 25,000 miles (40,000 kilometers) of navigable rivers and canals (not including the Great Lakes). The imprint of that transportation web becomes easier to see at night. The Visible Infrared Imaging Radiometer Suite (VIIRS) on the Suomi NPP (National Polar-orbiting Partnership) satellite acquired two nighttime images early on Oct. 1, 2013, for this natural-light, mosaic view of the continental United States. The VIIRS instrument uses a “day-night band” of wavelengths that is sensitive to low light levels and man made light sources. The images were collected just three days before the new moon, so reflected light from space and the atmosphere was relatively low. It was also a rare night when most of the nation was cloud-free. NASA's first-ever deep space craft, Orion, has been powered on for the first time, marking a major milestone in the final year of preparations for flight. Orion's avionics system was installed on the crew module and powered up for a series of systems tests at NASA's Kennedy Space Center in Florida last week. Preliminary data indicate Orion's vehicle management computer, as well as its innovative power and data distribution system -- which use state-of-the-art networking capabilities -- performed as expected. All of Orion's avionics systems will be put to the test during its first mission, Exploration Flight Test-1(EFT-1), targeted to launch in the fall of 2014. "Orion will take humans farther than we've ever been before, and in just about a year we're going to send the Orion test vehicle into space," said Dan Dumbacher, NASA's deputy associate administrator for exploration systems development in Washington. "The work we're doing now, the momentum we're building, is going to carry us on our first trip to an asteroid and eventually to Mars. No other vehicle currently being built can do that, but Orion will, and EFT-1 is the first step." Orion provides the United States an entirely new human space exploration capability -- a flexible system that can to launch crew and cargo missions, extend human presence beyond low-Earth orbit, and enable new missions of exploration throughout our solar system. EFT-1 is a two-orbit, four-hour mission that will send Orion, uncrewed, more than 3,600 miles above the Earth's surface --15 times farther than the International Space Station. During the test, Orion will return to Earth, enduring temperatures of 4,000 degrees Fahrenheit while traveling 20,000 miles per hour, faster than any current spacecraft capable of carrying humans. The data gathered during the flight will inform design decisions, validate existing computer models and guide new approaches to space systems development. 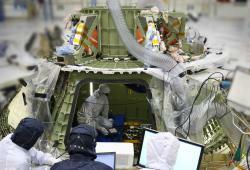 The information gathered from this test also will aid in reducing the risks and costs of subsequent Orion flights. "It’s been an exciting ride so far, but we're really getting to the good part now," said Mark Geyer, Orion program manager. "This is where we start to see the finish line. Our team across the country has been working hard to build the hardware that goes into Orion, and now the vehicle and all our plans are coming to life." Throughout the past year, custom-designed components have been arriving at Kennedy for installation on the spacecraft -- more than 66,000 parts so far. The crew module portion already has undergone testing to ensure it will withstand the extremes of the space environment. Preparation also continues on the service module and launch abort system that will be integrated next year with the Orion crew module for the flight test. The completed Orion spacecraft will be installed on a Delta IV heavy rocket for EFT-1. NASA is also developing a new rocket, the Space Launch System, which will power subsequent missions into deep space, beginning with Exploration Mission-1 in 2017. When the partnership built this cool orbiting clubhouse, however, they hung a sign above the rope ladder, reading “No guRlz aLoud!! !” Except instead of “gurlz” it said “China,” and presumably the spelling was a little better. Also, there was no sign or rope ladder, because that would be ridiculous. But the sentiment remained: China is not part of the ISS partnership, because Congress has banned NASA from any contact, collaborations or partnerships with China, because of concerns over technology transfer. 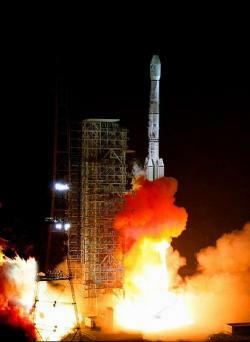 In response, China has gone ahead with a space station program of their own. China has plans to build a full size space station in the not too distant future, but for the time being, they already have an orbiting module—sort of a mini space station. The module, “Tiangong-1,” has actually been in service for almost two years already, and China launched a three-person “taikonaut” crew to practice docking with the module yesterday. This will be China’s fifth manned mission to Tiangong-1, and it includes the second woman from China to travel into space. What do y’all think? Exciting news? Would we be better off collaborating with China in space? Or are you all for a little competition? What’s the coolest name: astronaut, cosmonaut, or taikonaut? Let everyone know in the comments! Hold it there just a second, the reports earlier today that Voyager I has left the solar system may be a bit premature. NASA's team following the spacecraft say that they don't consider it to be outside of the influence of our Sun just yet. Confusing? You can read more about the official NASA position on this matter right here. Are we there yet? Voyager I leaves our solar system!!! Voyager ! : Voyager I has now left the sphere of our solar system after 35 years of space travel over 11 billion miles. It still hasn't had to stop to ask directions!! !Courtesy NASATo paraphrase Capt. Kirk, we've now gone boldly where no one has gone before. 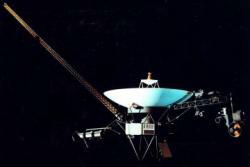 After 35 years and 11 billion miles of travel, NASA's Voyager I spacecraft has officially left our solar system. Measuring instruments on the craft no longer defect the movement of solar wind, which is the movement of particles influenced by energy released by our Sun, around Voyager I. Following not too far behind is Voyager II, which as covered about 9.5 billion miles. You can learn more about the milestone by clicking here. UPDATE: Wait a second, NASA isn't agreeing with this analysis on Voyager I's location. You can read more about this brewing science controversy here. Does Pluto have anything to do with this? The flyby of asteroid 2012 DA14 on Feb. 15, 2013, will be the closest known approach to Earth for an object its size, but there is no chance it will hit Earth. Got a spare two minutes? 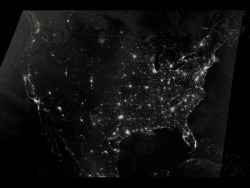 Watch this amazing composite photography made by NASA of Earth at night. 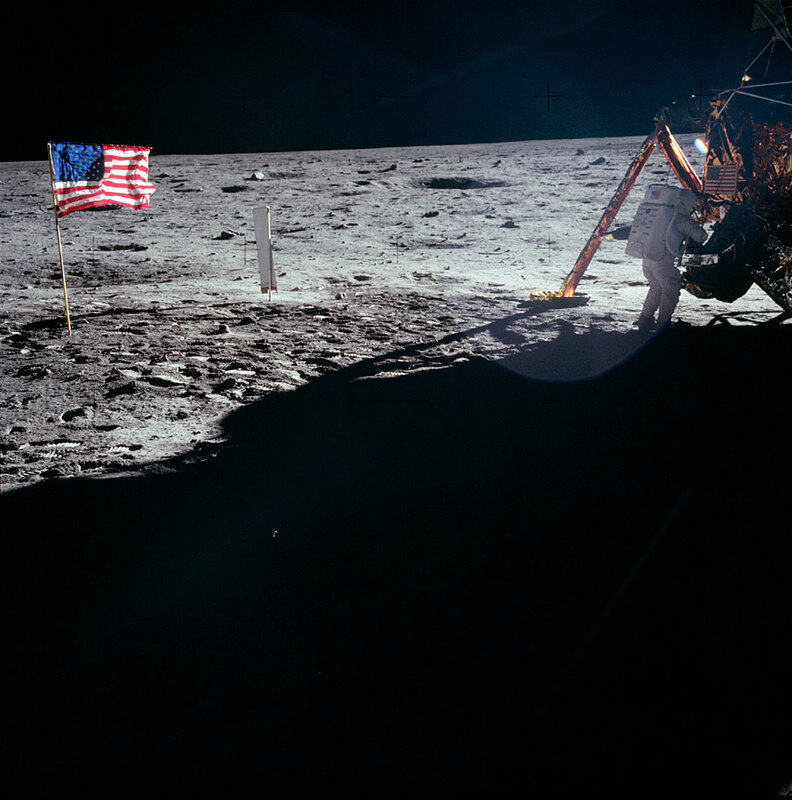 Where are all the Neil Armstrong Apollo 11 mission moon photos? 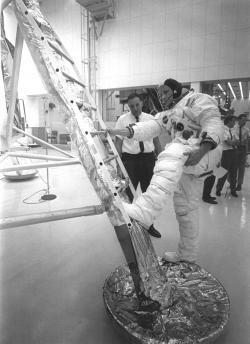 That's one big step for a man: Just days before the launch of the Apollo 11 mission, Neil Armstrong is photographed practicing his descent from the Lunar Module.Courtesy NASAWith the passing on Saturday of Neil Armstrong, the first man to walk on the moon, there has been a lot of media coverage of the Apollo 11 mission to the moon. 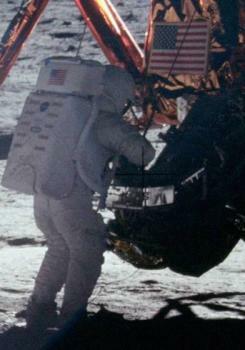 Armstrong, very private in his non-astronaut life, seems to be a bit camera shy during his time on the moon too. You can read – and see – all about it here.